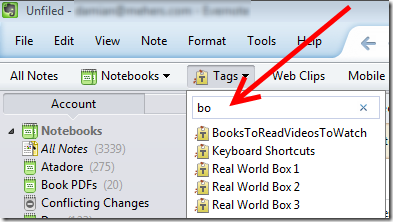 Evernote tip 5: So you have 30+ tags or notebooks? Filter them. I use Evernote both on Windows and on the Mac. I have many many tags. Recently I wanted to quickly see all the notes associated with a particular tag, and I was wishing that there was a way to filter the list of tags – I looked for some kind of text filter field on the tag list on the left, but it wasn’t there. Just before I wrote an email asking Evernote to consider including this handy functionality I explored a little, and what do you know? Filtering exists. This entry was posted in Evernote on August 29, 2012 by damian. Evernote tip 4: Forget about Tags, they are too much hassle – just search. Tags make it super-easy to find notes, however there is a cost. Not in terms of Evernote, it supports you creating more tags than you could possibly need, but in terms of you. If you use many tags, then each time you create a new note, you’ll need to think about what tags to tag it with, and this can become a burden. It can act as a brake, making you feel less inclined to use Evernote. Evernote has such quick and powerful search capabilities that it can be very easy to find your notes even without tags. I personally use tags a lot, but I know that many people don’t. If you find that tagging your notes is becoming a pain, and a barrier to using Evernote, consider not using many tags at all … instead just search. Next up: Find tags and notebooks quickly by filtering them. This entry was posted in Evernote on August 24, 2012 by damian. Evernote tip 3: What are Evernote Tags? In my previous tip I explained that each Evernote note can be stored in one, and only one Evernote Notebook. Notebooks are containers for notes. Tags are very different. Each Evernote note can be given many different tags. Imagine you are at a family reunion. You meet a cousin who you’ve not talked to for years, and find out they are living in New Zealand. You’ve always wanted to visit New Zealand, and in fact you have an Evernote tag called “New Zealand” and you’ve twenty or so notes with information about New Zealand that you’ve tagged with that tag. Prior to coming to the reunion you also created a tag “Family Reunion 2012” since you knew you’d be collecting lots of memories that you’d want to store in your trusted permanent store (aka Evernote). With tags you don’t have to make a choice, you can create a note with contact information from your cousin, and perhaps a photo, and tag it with both “New Zealand” and “Family Reunion 2012”. That way, when you finally get around to booking your trip of a life time, you can select the “New Zealand” tag and see that note, among all the others. Also, in 30 years time, in 2042, when you are reminiscing about that family reunion, you can click the “Family Reunion 2012” tag and see that note, complete with photo, as well as all the other notes you created at the family reunion. Tags provide a way of grouping your notes. You can slice and dice your thousands of notes in different ways – each tag provides a different perspective into your collection of notes. At the start of this year I moved the twenty or so physical folders taking up space in my office down to my basement. There was a folder called “Kids” with dividers for “School”, “Soccer”, “Music” etc. There was a folder called “Bank” with sections for various bank accounts. There was … you get the idea … you probably have the same thing. Once they were all downstairs I recreated an equivalent structure in Evernote using tags. A tag called “Bank Accounts”, a tag called “Kids” etc. I can’t tell you what a pleasure it is to be able to effortlessly pull out some document I need for my taxes in seconds, or to see what the kids swimming schedule is, or what my last car insurance bill was. All at my finger tips, on all my devices, no matter where I am in the world. Its actually better than my real world folders were, because I can tag notes with multiple tags. Whereas in the real world I’d have to decide whether to file a bank statement into my Bank folder, or my “Taxes 2012” folder (because I’d need it for a tax return), with Evernote I can tag it with as many tags as I wish, letting me then find it in different ways depending on what I’m doing. I’m using tag hierarchies in the picture, which I’ll cover in a later tip. Next up: Forget about Tags, they are too much hassle – just search. This entry was posted in Evernote on August 23, 2012 by damian. Evernote tip 2: What is an Evernote Notebook? So what if I have 80 notebooks? The first time you started Evernote on your Mac or PC you saw on the left hand side a list of “Notebooks”. It’s oh so tempting to jump in and create a load of different notebooks to store your notes. There is a good chance that you went and created a whole bunch of notebooks, and then, a few months down the line, discovered you were not using them, and felt vaguely uneasy about not using Evernote “properly”. Here is what you need to know about notebooks: Each Evernote note can be in one, and only one notebook. Imagine you are on vacation this summer. You are at a restaurant and have a fantastic bottle of wine. Of course you want to capture the memory, so you create an Evernote note on your mobile device, perhaps even with a photo of the label. Which notebook do you store this note in? If you’d created a notebook called “wine” and another called “holiday2012” you’d be stuck – a note can be stored in one, and only one notebook. In fact it’s a trick question – you shouldn’t use notebooks to classify your notes like this – for that you’ll use tags (coming up tomorrow). So what should you use notebooks for? Use notebooks as bulk containers of notes. You can share notebooks with other people, and you can also choose to sync selected notebooks on mobile devices so that they are available when there is no internet connection. Personal contains all other notes. You’ll be unlikely to have many more notebooks than this unless you do a lot of sharing. I recommend that you start off with just one notebook and only create more if you have a really good reason. Don’t worry if it contains thousands of notes since as you’ll see later, tags provide a great way to group your notes, and Evernote’s search facility makes it very easy to find your notes. Next up: What is an Evernote Tag? This entry was posted in Evernote on August 21, 2012 by damian. Nevertheless there are tips and tricks I’d like to share: features that are a little hidden and ways of thinking about Evernote that might not be intuitive. My intention is to share these ideas in small, bite-size blog posts, starting with the basics and working my way up. So, don’t worry, you are not “using it wrong” – I think that the key to using Evernote is to find a use that works for you, whether it is photographing and cataloging your wine, keeping a copy of the notes your kids bring home from school, storing business cards, remembering where you parked your car, whatever. Start using Evernote to make your life easier for something specific, and then expand from there. Next up: what are notebooks? What are tags? Why would I use one or the other?